Our Forza Athletics team currently consists of Luis Rivera, the Puerto Rican National Record Holder in the 35lb. Weight Throw (22.01m) and the 2016 Division III National Champion in the Weight Throw. Luis completed his 2017 season with a personal best throw of 63.23m in the Hammer. 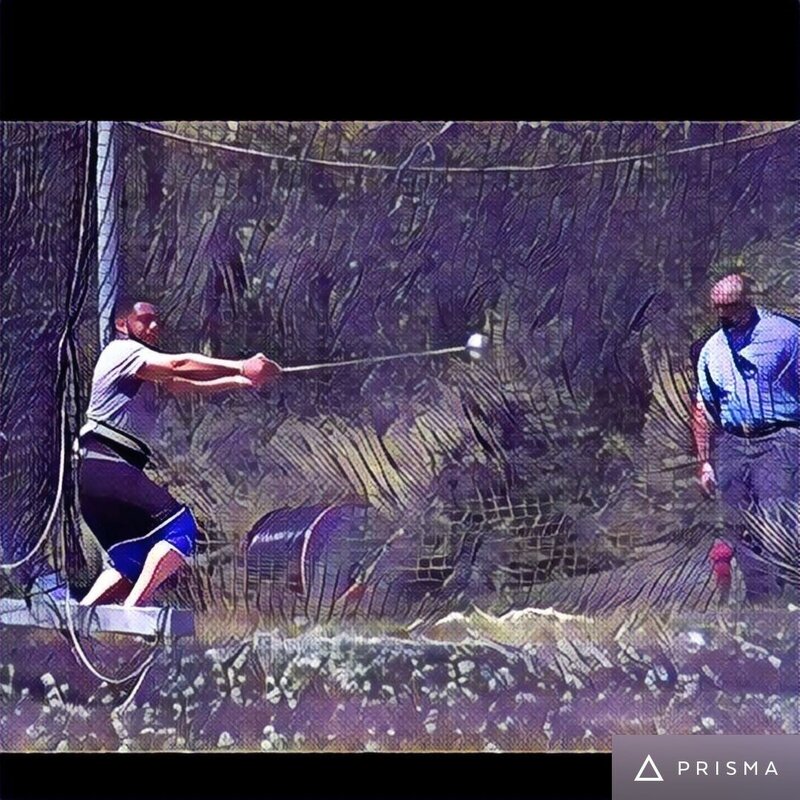 In 2017, Luis added over 1.5m to his Weight Throw personal best, as well as 4m to his Hammer personal best. Luis has continued with the success he achieved last year with a great start to 2018. In February, Luis finished 7th at the USATF Indoor Championships. Luis will open his outdoor season this Friday, April 20th, at the Jesse Owens Classic on the campus of The Ohio State University. 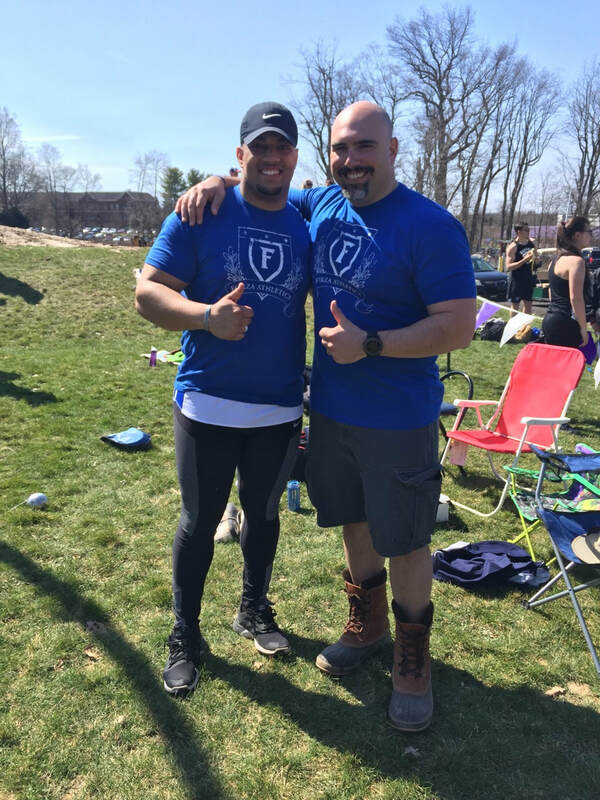 Luis Rivera and Coach Infurna at Nazareth ROC Classic in 2017. Photo Credit goes to Monique Hardy. 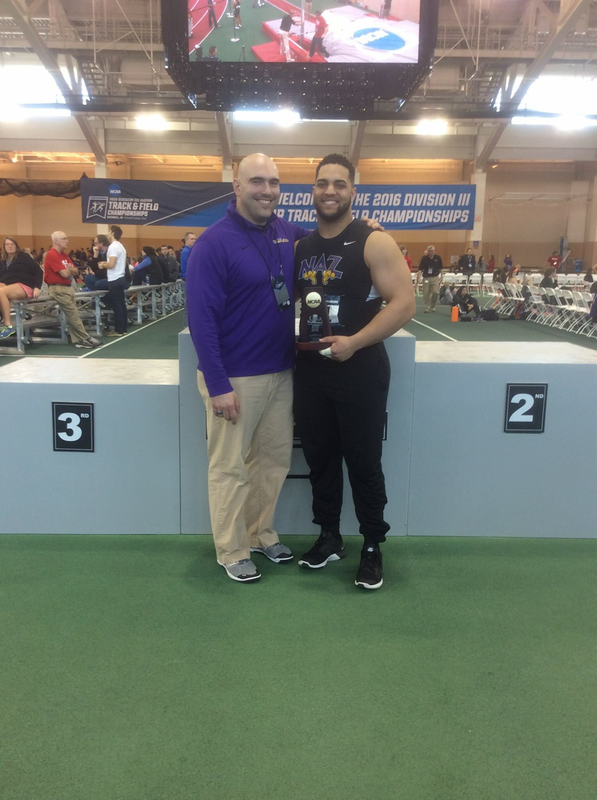 2016 Division III Indoor Nationals with Luis Rivera. Luis won the 35lb. Weight Throw. His winning throw of 20.45m ranks him 6th all-time in Division III. Now a sophomore at Webster Thomas High School, Monique Hardy cemented her place as one of the top up and coming throwers in not only Section V, in the country as well. In her first year of throwing the Weight, Monique won the Section V Class A Girls Weight Throw Championship with a throw of 45'8.75". Monique most recently competed at the New Balance High School National Championship Meet in New York City. Monique placed 3rd with a throw of 48'. A fantastic first season for this up and coming thrower. Following up her amazing freshman indoor season, Monique competed in multiple hammer competition after her high school outdoor season was complete. 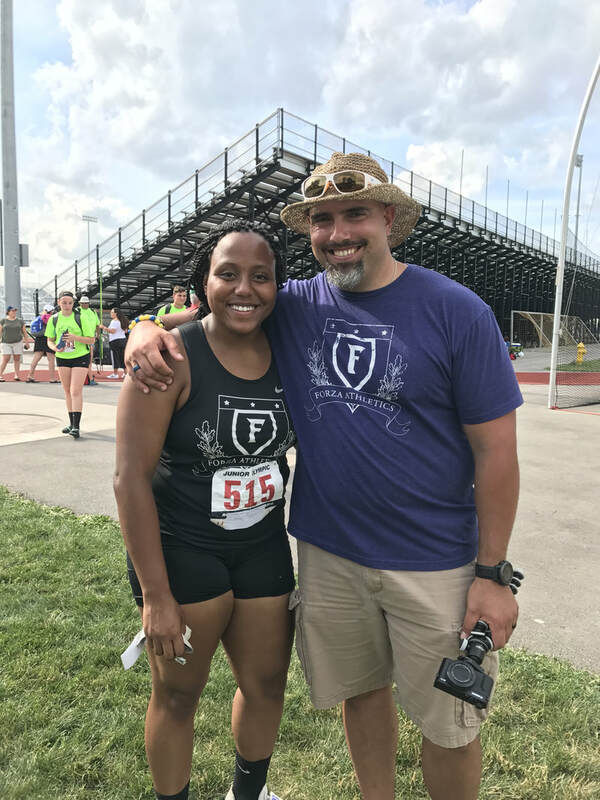 Monique broke the New York State freshman hammer record at the Junior Olympic qualifier meet held at SUNY Brockport at the beginning of July. Monique had the overall best throw of the day, throwing just over 46m, to win the 15-16 year old age group. She carried that momentum into the National Junior Olympic meet in late July, where she finished 2nd in the 15-16 year old age group with another record setting throw of 47.50m. Building upon the success of her freshman season, Monique re-wrote the Section V and New York State record books in 2018. Monique broke the Section V and New York State sophomore 20lb. Weight Throw record in February with a throw of 56'3". That throw ranked Monique #5 in the USA, #1 in New York State, and #1 sophomore. Monique won the Shot-Put and 20lb. Weight Throw at the Monroe County Championships. She also won the 20lb. Weight Throw at the Section V, State Qualifier, and New York State Championships. Monique finished 4th at the 2018 New Balance Indoor Nationals in the 20lb. Weight Throw. Following up her spectacular indoor season, Monique recently finished 2nd at the New Balance Outdoor High School National Championships with a throw of 56.15m, which broke the New York State sophomore class record. 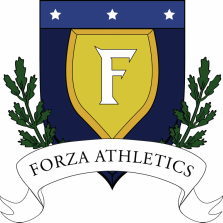 Drew Palermo, a senior thrower at Spencerport High School joined the Forza team in 2018. Not to be outdone by his teammate Monique, Drew had a 2018 indoor season for the ages. Drew became one of four throwers in New York State history to throw the 25lb. Weight 70' and the Shot-Put 50' in the same season. Drew won both the Shot-Put and 25lb. Weight Throw at the Section V Championships, along with winning the 25lb. Weight at the State Qualifier meet. He finished fourth in the 25lb. Weight Throw at the New York State Championships, along with an 8th place finish in the Shot-Put. Drew finished his historic indoor season with a monstrous throw of 70'3" to finish 4th at the New Balance Indoor National Championships. Luis Rivera, Drew Palermo, and Coach Infurna the the Section V State Qualifier Meet. Photo Credit goes to Mrs. Palermo. To maintain an encouraging and constructive training environment that inspires athletes to have limitless dreams surrounding their potential as athletes. This will be accomplished by teaching skills in a cultivating and deliberate atmosphere, while allotting athletes the autonomy they need to reach their goals. Athletes will be provided guidance, mentoring, and camaraderie in pursuit of their aspirations as students and athletes. 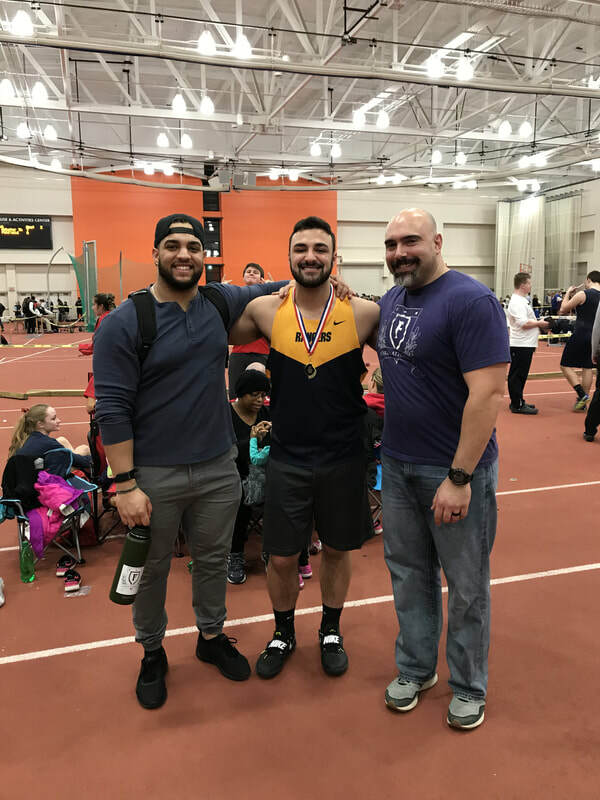 In my 10 years of coaching at the Division III level, I have had the great pleasure and privilege to have coached and mentored two Division III National Champion Weight Throwers, 10 All-Americans, multiple ECAC champions, and numerous SUNYAC and Empire 8 Conference Champions in the Hammer, Weight Throw, Discus, and Shot-Put. 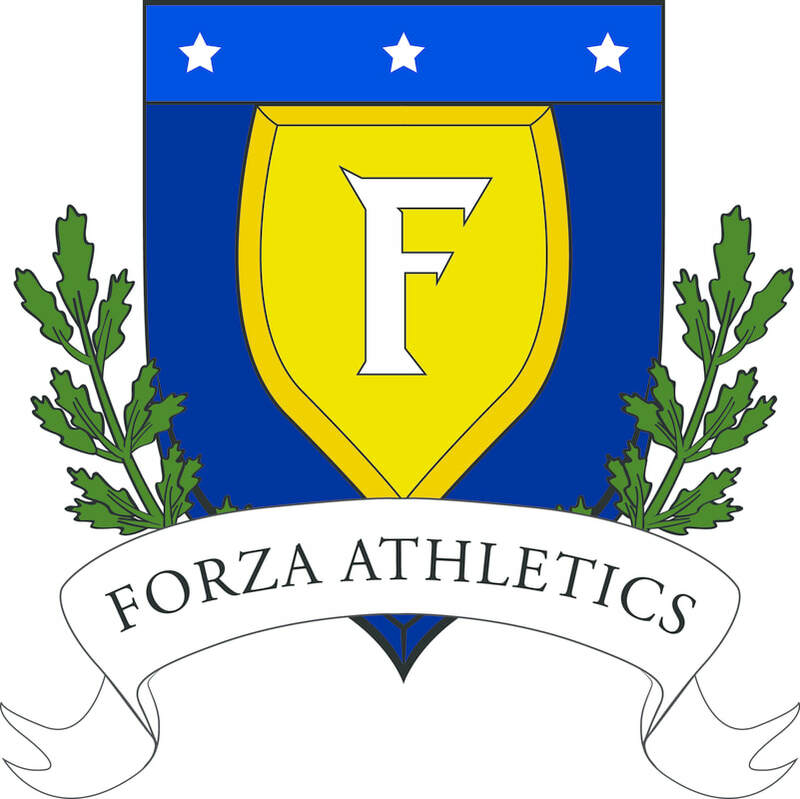 Forza Athletics high school throwers have won one New York State Championship (20lb. Weight Throw), multiple Section V Championships in the Shot-Put and 20lb./25lb. Weight Throw, and hold both the men's and women's Section V records in the Weight Throw. The women's record is held by Monique Hardy at 56'3". Drew Palermo holds the men's record, throwing 70'3". Monique Hardy also holds the New York State freshman hammer record (47.50m), New York State sophomore record (56.15m), and the New York State sophomore 20lb. Weight Throw record (56'3"). 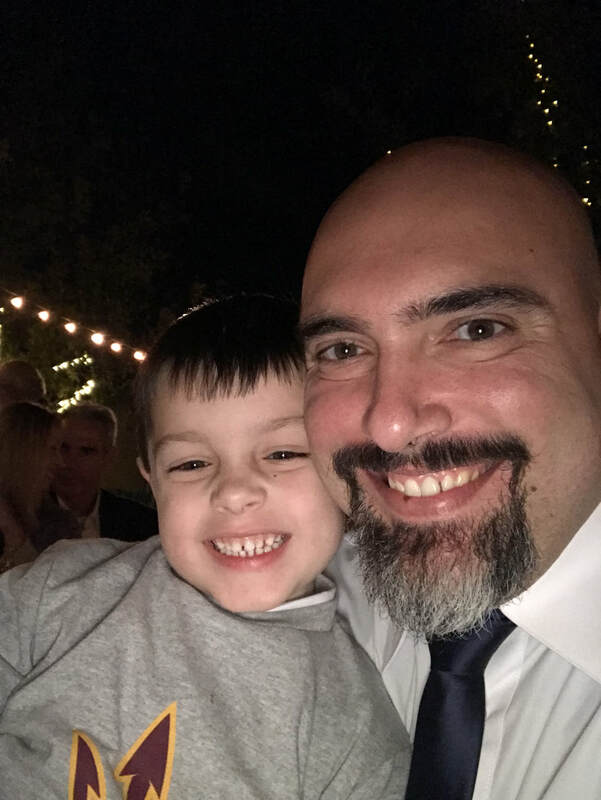 If you are interested in scheduling a customized throwing session with Dr. Infurna or Coach Rivera, please complete the form below.